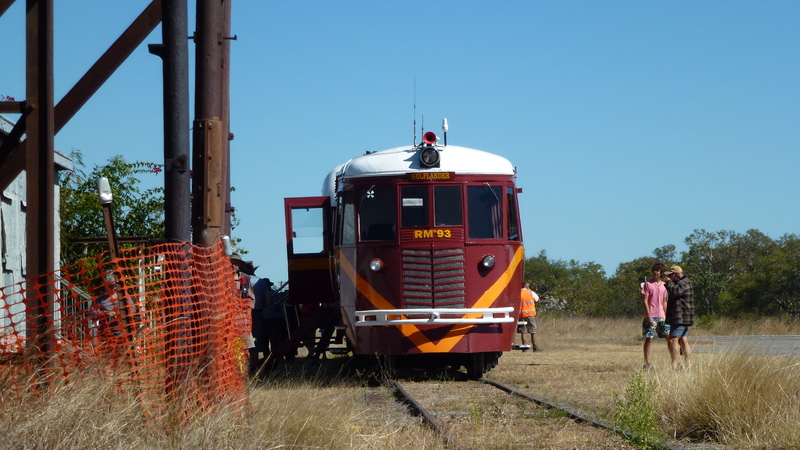 Today was scheduled to be a drive up onto the Atherton Tableland and a steam train ride from Ravenshoe to Tumoulin and return. We were told right at the beginning of the trip that the steam train had been taken out of service only a couple of days earlier, to until at least the end of the year. 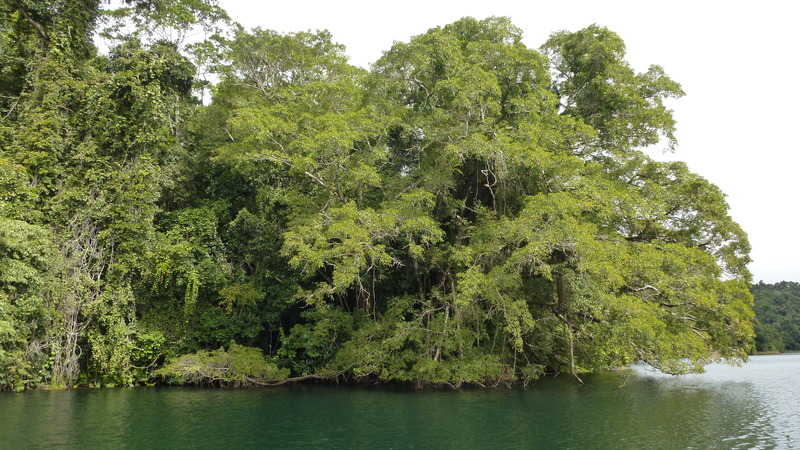 The tour company, instead, organised a bus tour around the Tableland and a cruise on Lake Barrine, a crater lake I’d visited before. On that occasion I walked the 5.6km trail so it was really interesting to see it from the water and to get a totally different feel for the place. 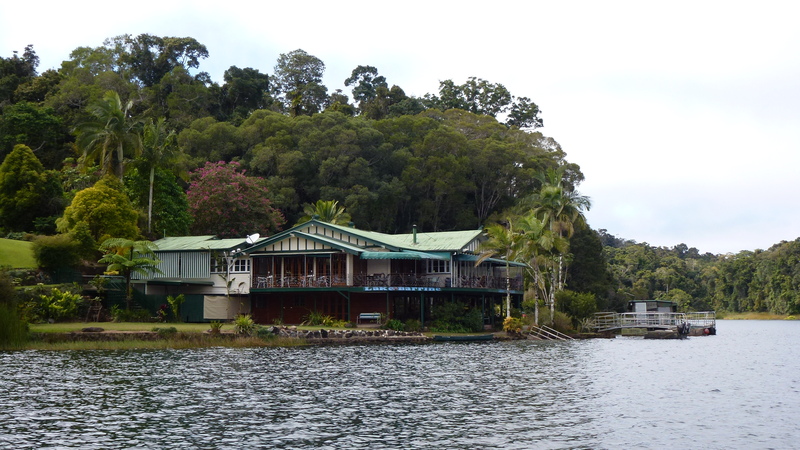 The flat bottomed boat was driven by batteries so it was lovely and peaceful to boot. 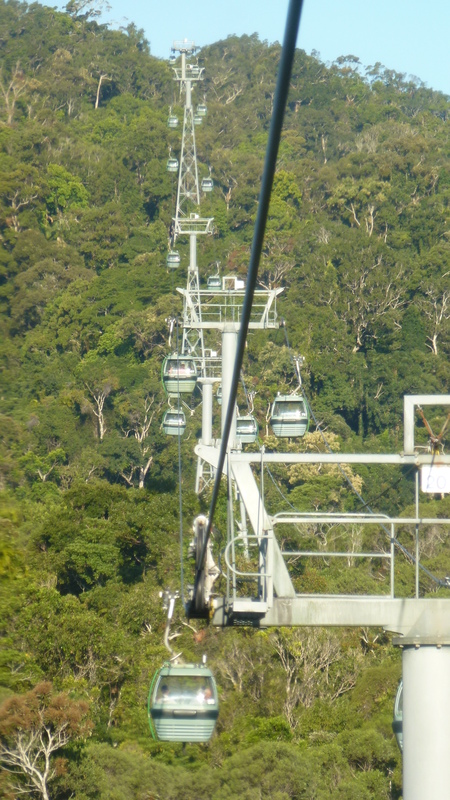 As an added bonus, an attempt to dampen the disappointment of not having the steam experience, we travelled from Kuranda to Cairns down the 7.5km long Skyrail Rainforest Cableway. 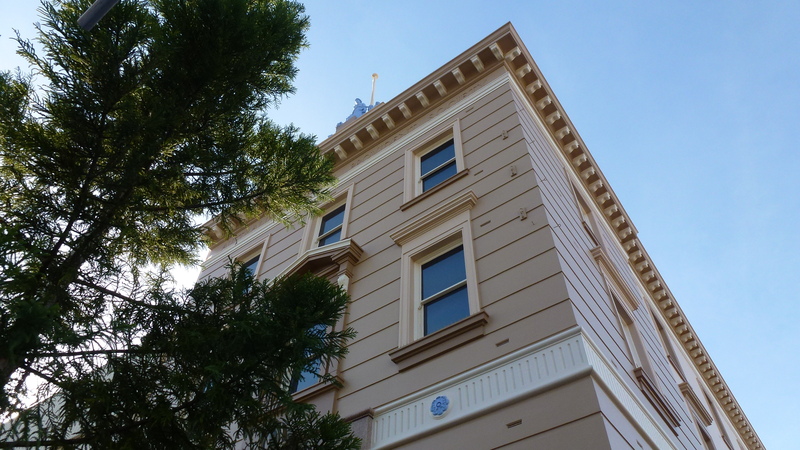 It took 12 months to construct and was opened in 1995. This was after the 7 years it took to get the necessary planning and approval processes dealt with. All the towers, there are 33 of them, were lifted into place by a heavy-lift Russian helicopter. The highest tower is 40.6m high and there are 114 gondola cabins. 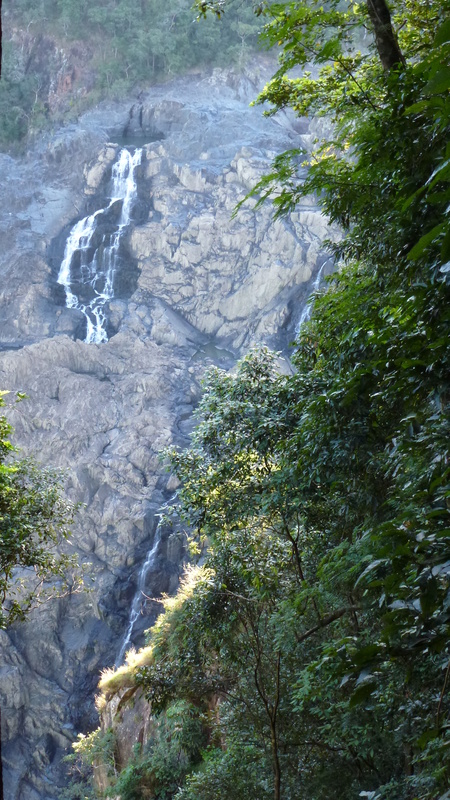 There are two stopping points on the cableway, an opportunity to leave the gondolas and take short walks to viewing platforms, a couple of which look over Barron Falls. 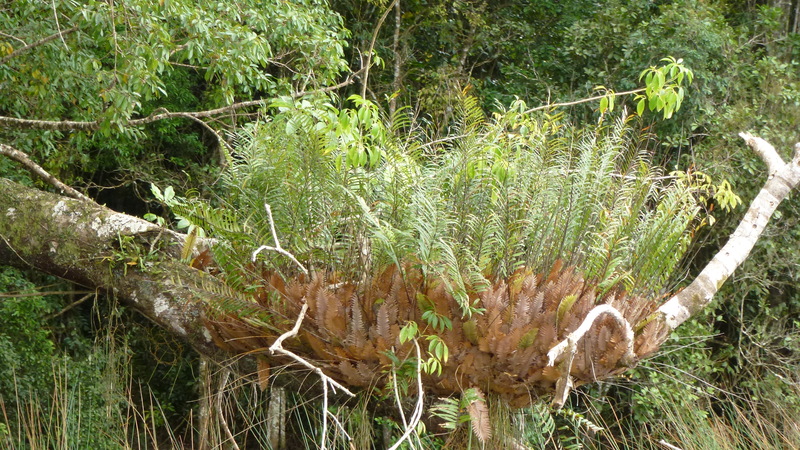 It was a fascinating ride over the top of the tropical rain forest. In Cairns we stayed in The Hotel Cairns. It was a very nice hotel, centrally located, one parallel street off the Promenade, so it was easy to get anywhere but not noisy. 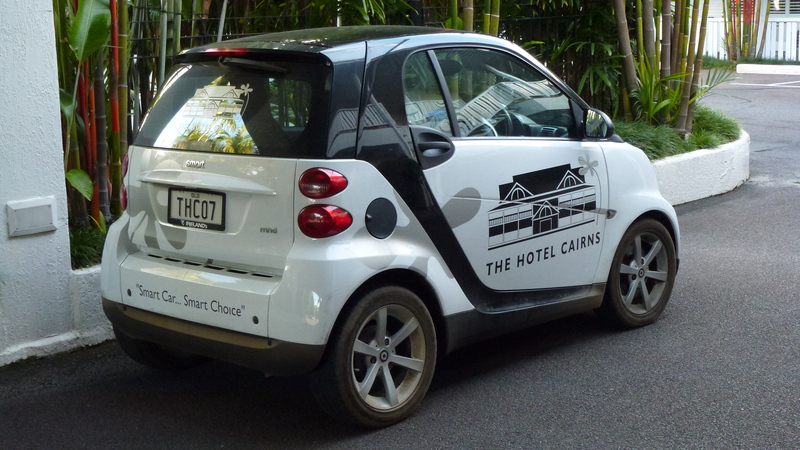 The remarkable thing about the hotel was that it had Smart cars for free! Free as long as you paid $30 insurance and had the vehicle back by 11pm. I’ve never come across this sort of deal before. 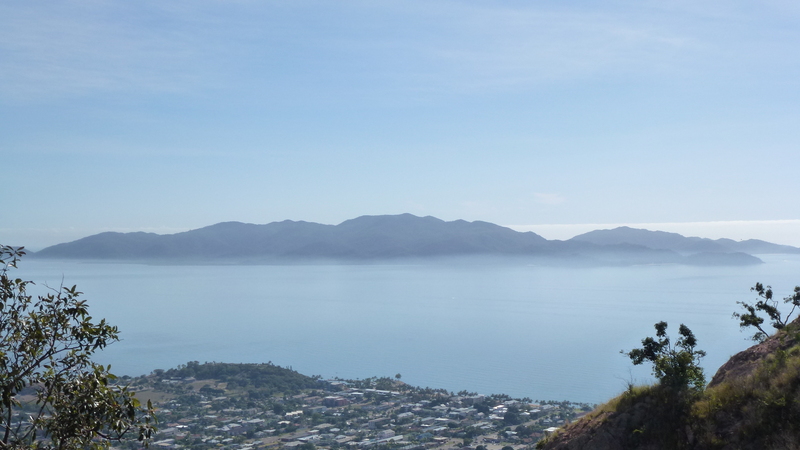 An early morning was called for this morning as we had to have breakfast finished by quarter to seven so we could be transferred by bus the 48km back to Forsayth in time to catch the ‘Savannahlander’ which was to take us to Mt Surprise, and later, on the Cairns. From Forsayth to Mt Surprise, a distance of 162km, the 20 pound rail had been laid as cheaply as possible. To this extent, the track even ran along a river bed as that route was much cheaper than constructing a cutting higher up the steep bank. As the train didn’t run during the wet, it didn’t matter that the line would be under water for a couple of months each year. 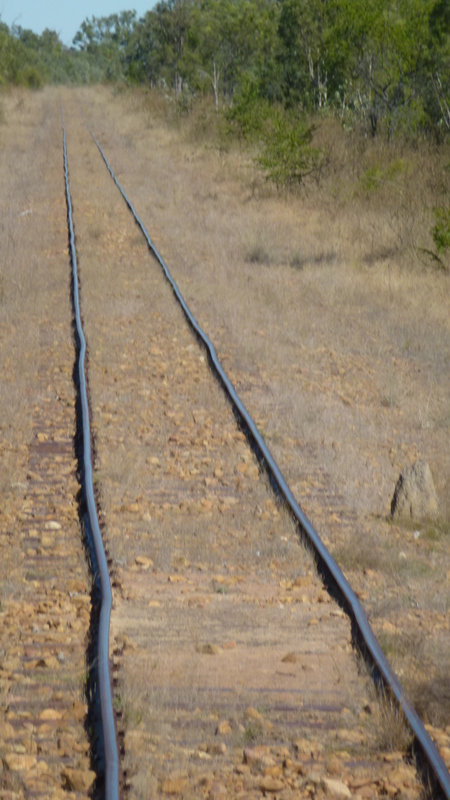 Steel sleepers were again used, laid directly onto the ground without any ballast or formed track bed. It was a slow but very relaxing journey up and over the Newcastle Range. 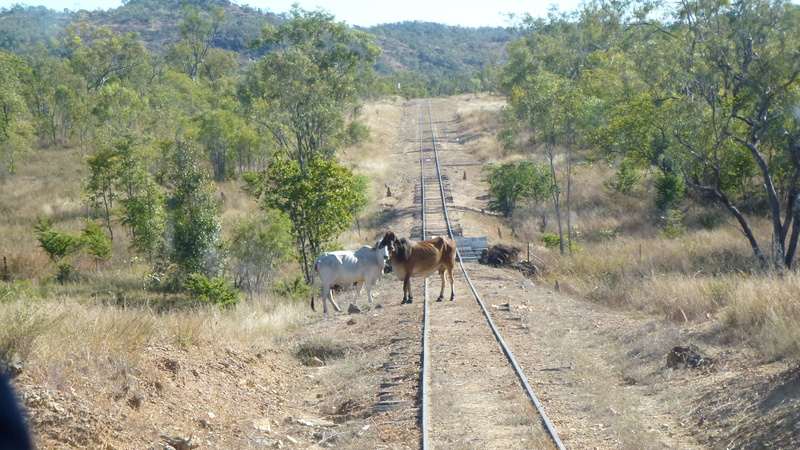 Often we had to slow down to wait for cattle to cross the track but as we were only travelling at 20 – 40k/h, this didn’t really pose too much of a problem it just added to the quaintness of the whole experience. 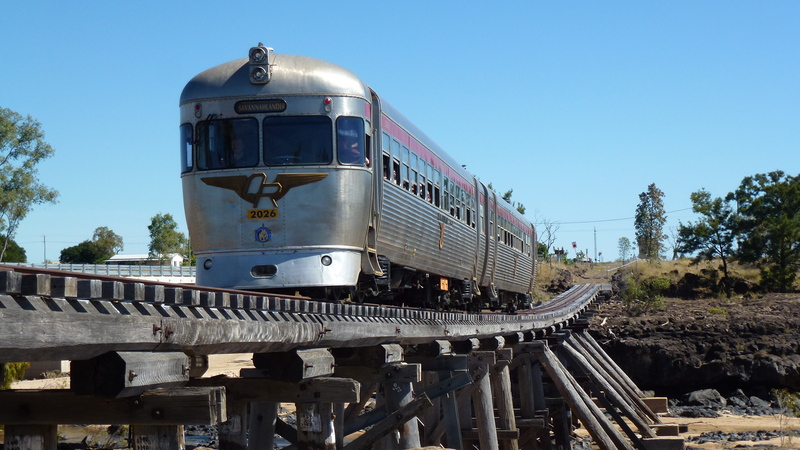 The ‘Savannahlander’ only runs once a week, taking two days each way. All the distances on the ‘Savannahlander’ line are in kilometres as its track is physically joined to the main QR network. 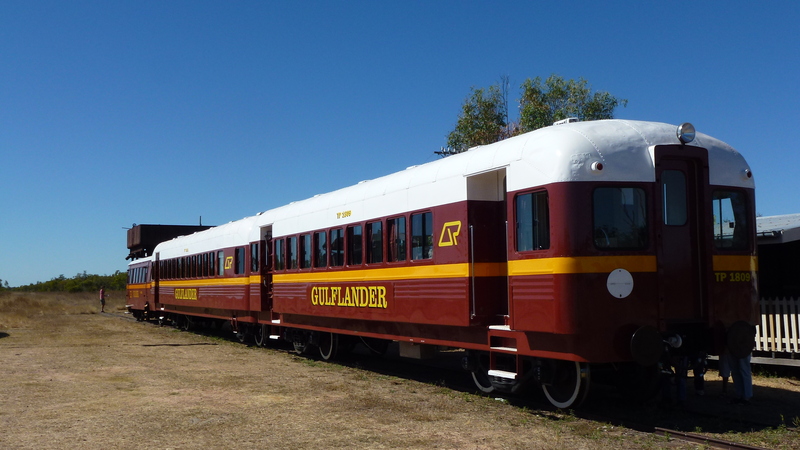 As the ‘Gulflander’ line is an isolated section of track, the distances are still in miles as this better represents the era during which the ‘Gulflander’ was the main means of travel through the Outback, a time before roads were built and long before Australia went metric. 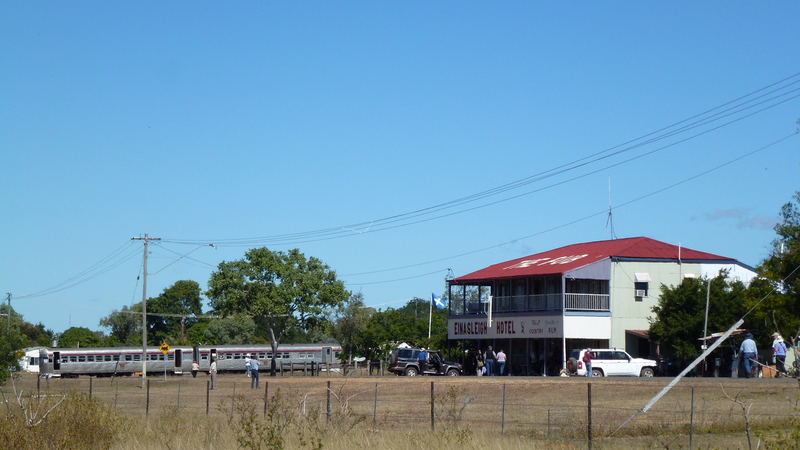 Again, our lunch order was phoned ahead to the one and only place that could provide food in Einasleigh – the pub. I don’t think there is anywhere else for anything else in Einasleigh! The train just slowed to a stop at the crossing with the main road and we all got off and walked the couple of hundred metres to the hotel. Here our lunches awaited us along with the odd liquid refreshment. A bit further on from the pub is the rather Copperfield Gorge. Most of us took the opportunity to stretch our legs and walk the half kilometre or so for an inspection. It was worth the effort. 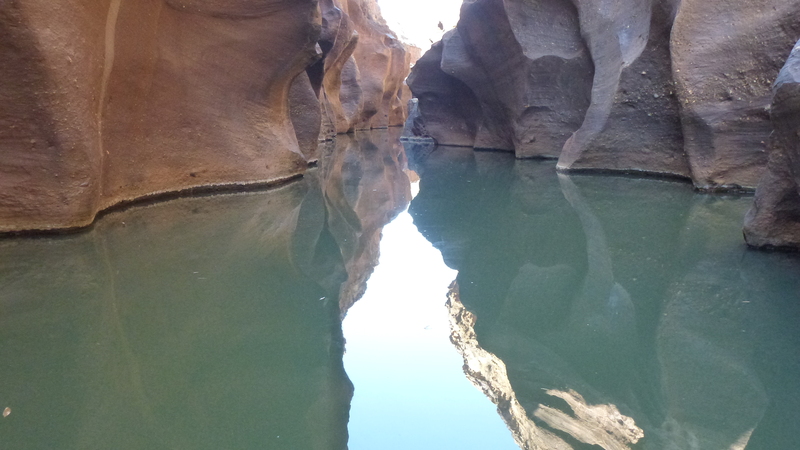 The river has cut a deep and narrow cleft through the rock leaving interesting shapes, pools and colours in its wake. After our lunch and exercise we reboarded the train for the run to Mt Surprise. The railway line of course crossed the river we had just taken a look at so the photographers amongst us we treated to a ‘Savannahlander’ exclusive. The train traversed the bridge, let us off, then it backed up to the other side. Once we were all in place the train made a slow crossing of the bridge. Many pictures were taken. Obviously it stopped for us to get back on, all happy little Vegemites. 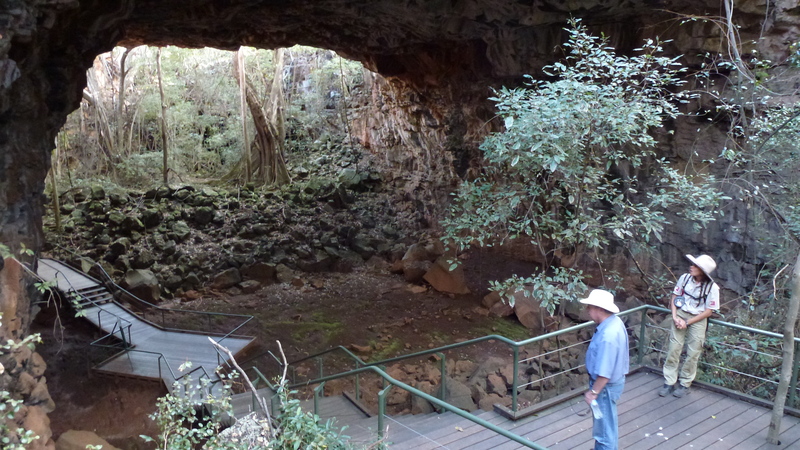 We arrived at Mt Surprise at 2.30 and were transferred by bus to Undara Lava Tubes Village. We just had time to drop our bags in our converted old wooden railway carriages which were to be our overnight accommodation before a guided tour of the lave tube complex began. The tubes formed as the surface cooled but the flow beneath was great enough to keep flowing for up to 160km in a NW direction. Once the eruption ceased the insulated lava drained away, thereby creating the pipelines. Over time weaknesses formed and portions of the tubes collapsed. This is what gives access to the remaining system. Much has been filled with sediment and not all the tubes are accessible, however an impressive amount is open for 2 and a half hour guided walks. 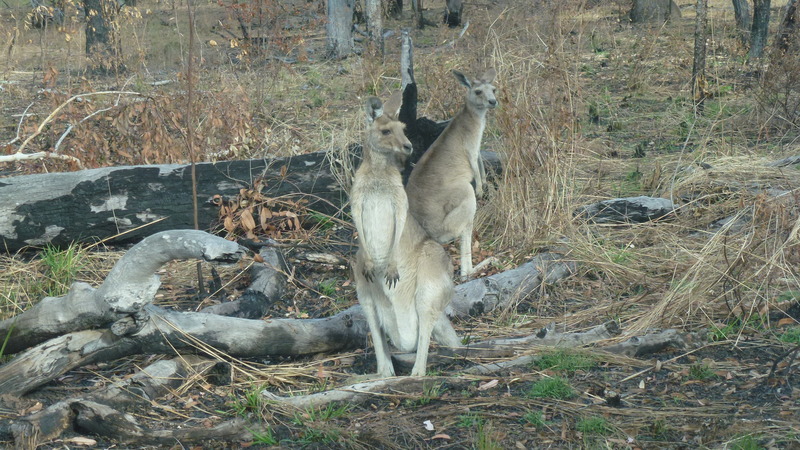 On the short drive back to the camp we saw Pretty-faced and Grey Eastern macropods. 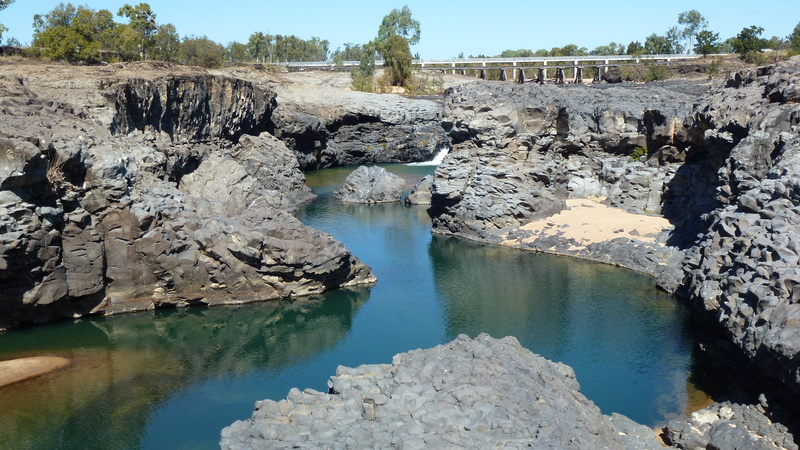 Cobbold Gorge can be found on Robin Hood Station which is 48km SE of Forsayth in Queensland. Robin Hood Station is a 1284 square kilometre property which is currently running 15,000 head of Brahman and Brahman/cross cattle. 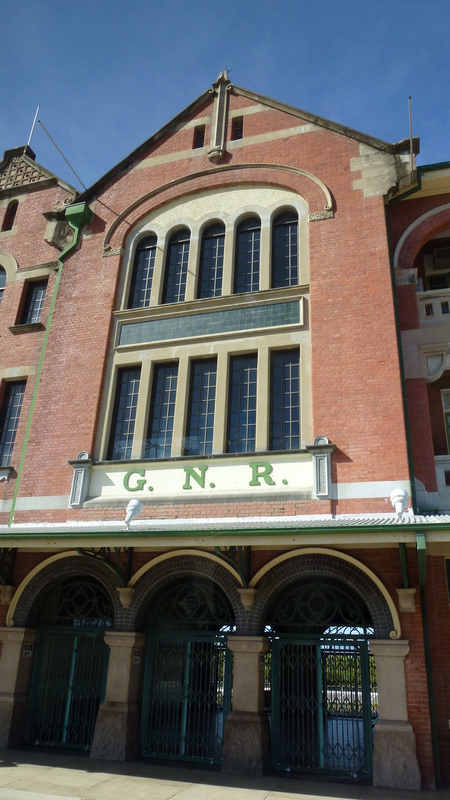 It is located in the Newcastle Ranges. 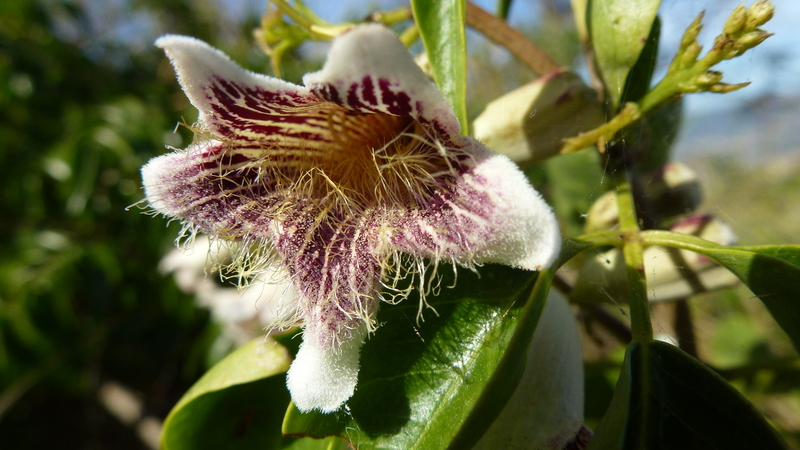 A 4720ha Nature Refuge was declared on 5 June 2009 which protects rare and vulnerable plant species such as Solanum carduiforme, Gilbert River Ghost Gum (Corymbia gilbertensis) and Leptospermum pallidum. The refuge also connects several wildlife corridors. 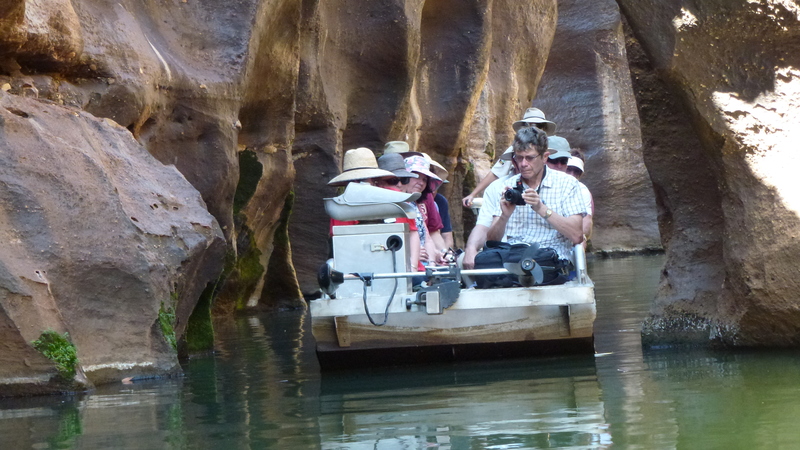 Cobbold Gorge is around 6km long but only the last 500m is accessible by flat bottom boat. It has 30m high vertical walls and is only 2m wide in places. 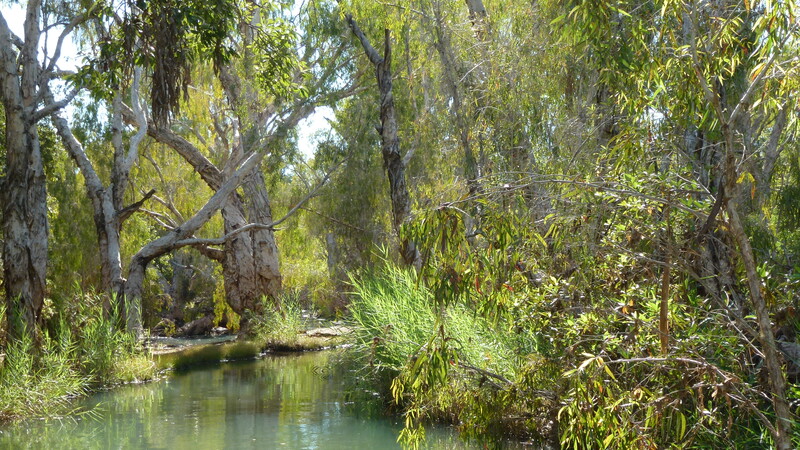 It is fed by several springs which keep the water level constant during the dry winter period of the year. It becomes a raging torrent during the summer wet. 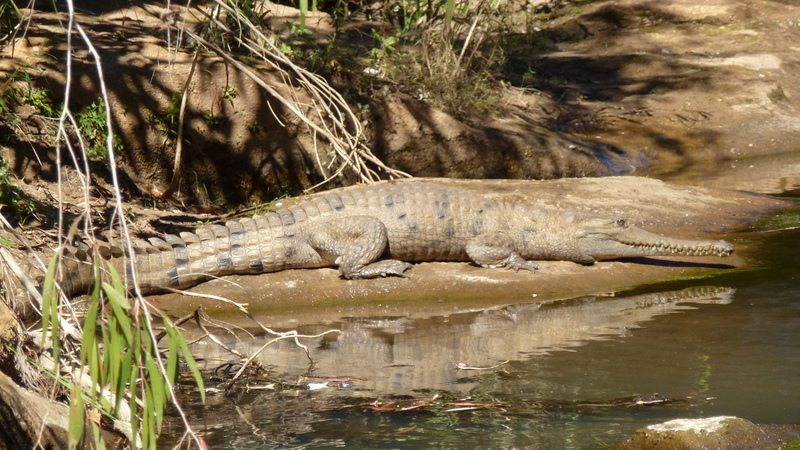 Johnson River crocodiles basked in the sun on flat rocky ledges, mostly oblivious to us. 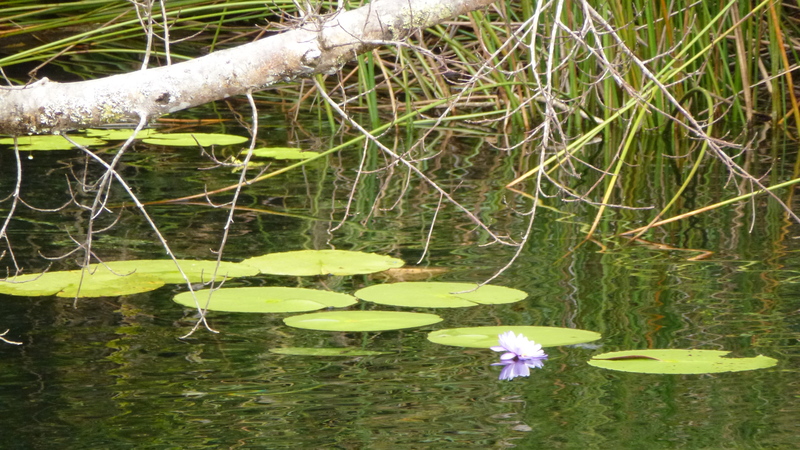 A couple of them took umbrage at our presence and slipped off into the water to insidiously sink below the surface. 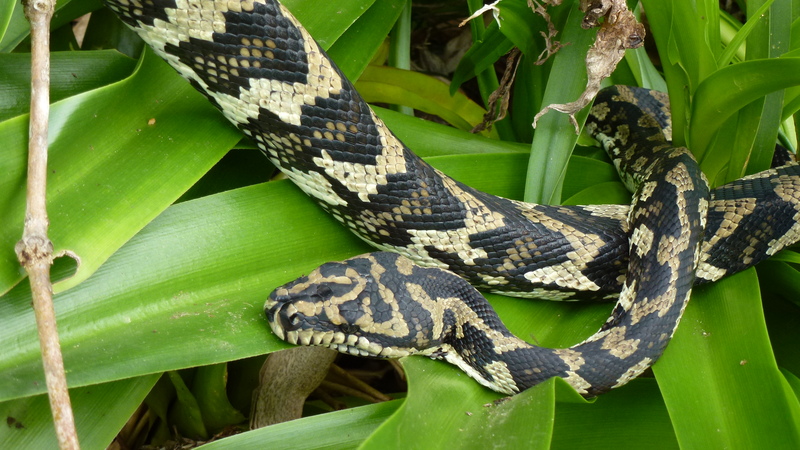 They have never been known to kill a human. Nonetheless, they don’t endear themselves to me under any circumstance, no matter how nice they maybe. 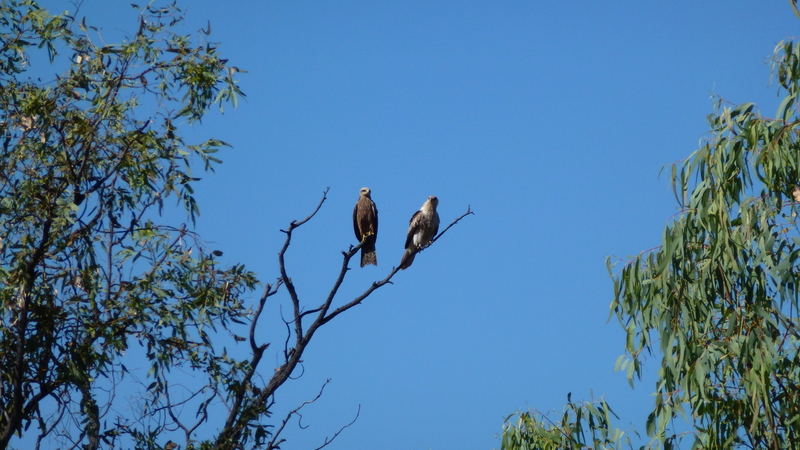 There was quite a lot of bird life including a snake bird, parrots and whistling kites and a wedge-tailed eagle flying overhead. 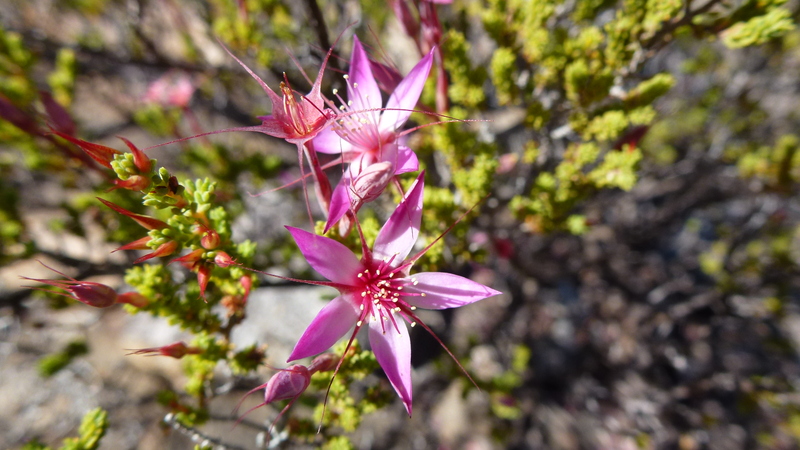 There were a couple of wattles in flower along with a red-flowered grevillea. It was a most interesting morning on the water after first of all walking around the top of the gorge. In the afternoon there was a tour of the workings of the Robin Hood Station, which I declined, instead choosing to go for a walk around the settlement. 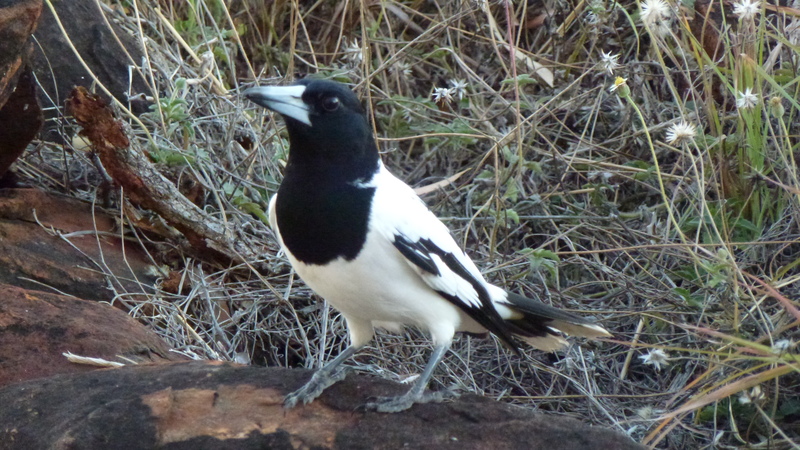 There were a couple of walking tracks which produced more birds including a wren, red-tailed black cockatoos, pale-headed and rainbow lorikeets and some unidentifiable honey-eaters. A better option, I thought, to seeing another cattle station, a few of which I’ve toured around before. Back at the camp and after a cleansing shower, I sat on a chair outside my cabin upon which no sooner had I settled onto my chair than a couple of butcher birds turned up on my roof. They looked hungry, so, having some of those cashews I bought in Cairns left, and with me, I crushed one up and sprinkled it on the far corner of the small table. I hadn’t got my hand back to pick up my whisky than the first bird was on the table enjoying my offering. Soon joined by his mate I was having a better bird experience than that gained on the earlier walk. 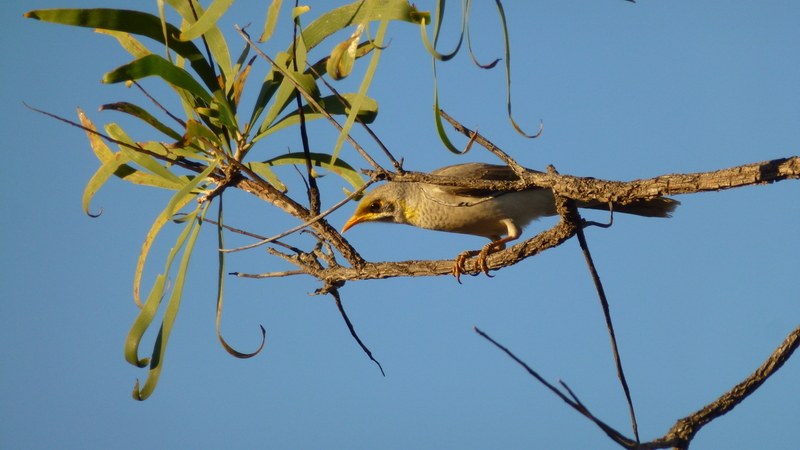 Not to be outdone, a couple of noisy minor birds turned up closely followed by a flock of grey apostle birds. I was in heaven, although the butcher birds were too busy eating to sing for me. They must have listened to my mother who always said you shouldn’t talk with your mouth full, or sing for that matter either! 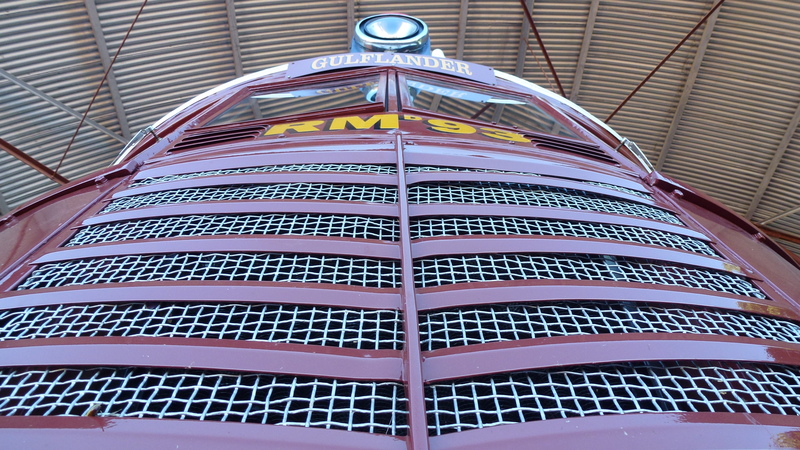 The present ‘Gulflander’ (RM 93) has a 102hp Gardner diesel motor. 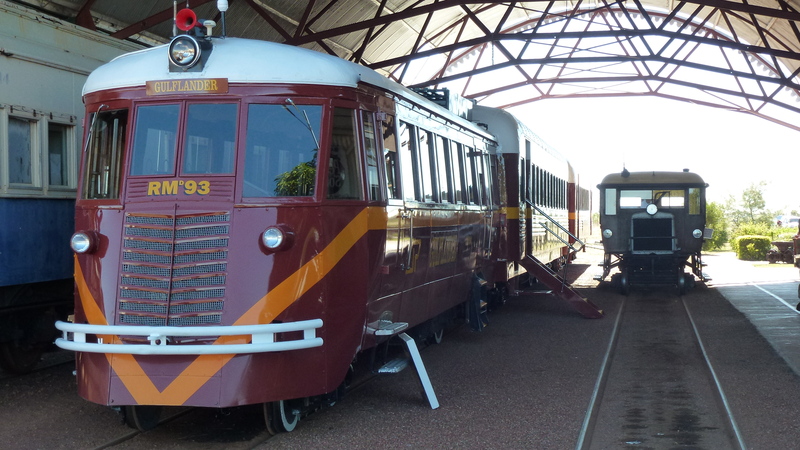 It was built in the Ipswich Railway Workshops in 1950 and arrived in Normanton in 1982 having served on other parts of the Queensland Railways network for the intervening 32 years. The ‘Gulflander’ leaves Normanton at 8.30am every Wednesday and has done so ever since it began running all the way to Croydon on the 20th July 1891. It returns from Croydon on Thursday after an overnight stop. 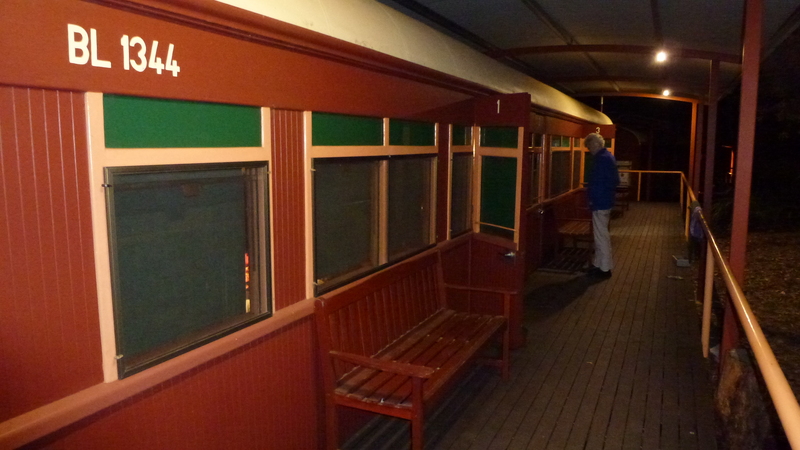 The train consisted of the rail motor itself and two carriages, each a bit younger than the rail motor. 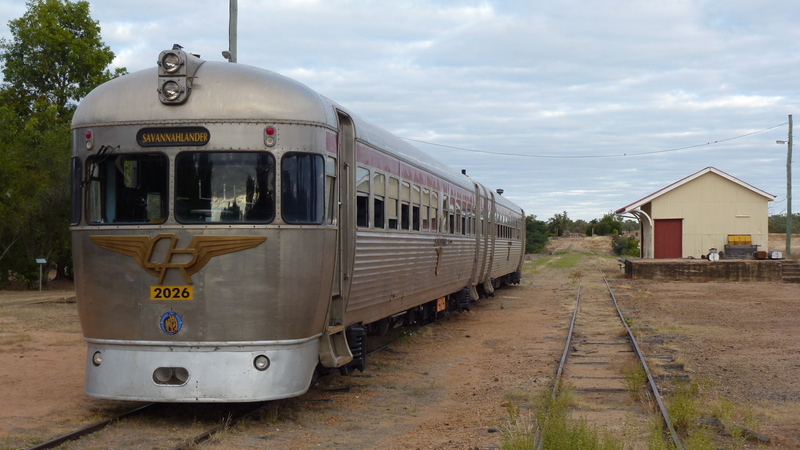 Each of these coaches was refurbished a couple of years ago and were quite comfortable to travel in – if the condition of the track is taken out of the equation. The track is quite interesting as it was laid using metal sleepers, some sourced from Australia and some from the UK. They were designed by QR’s Inspecting Surveyor, George Phillips, as he understood the difficulties of constructing a railway line through the monsoon flood plains of the district. He envisaged a line that would offer as little resistance as possible to the masses of water which result from the torrential rainfall the area gets during the monsoon season. His metal sleepers were “U” shaped in construction and were filled with mud and laid directly onto the soil the line traversed. There was to be no embankment or ballast. As this line is still 98% intact after 124 years attests to the vision of this early engineer. The first track of the Normanton to Croydon railway line was laid on 2nd July in 1888. 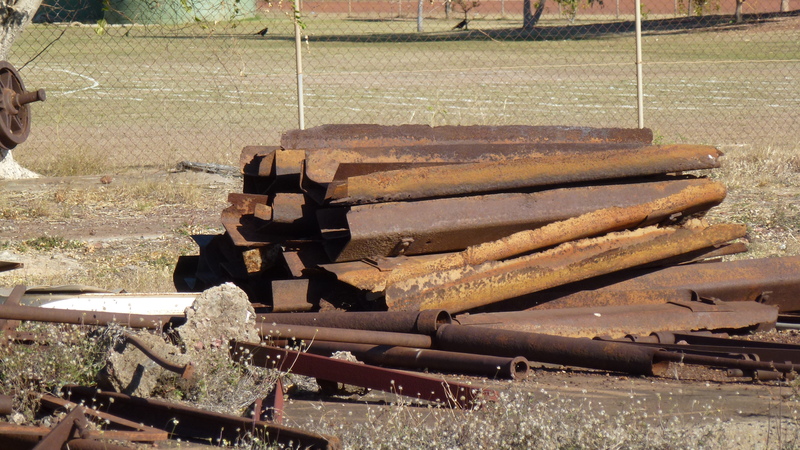 Metal was used for two main reasons: firstly because there were no suitable timber trees growing in the area for wooden sleepers and secondly: because termites would have eaten out the wooden sleepers which would have needed replacing every couple of years. Mind you, the track has deteriorated a bit over time and is not as smooth or straight as it was when built. The train manages around 40k/h for most of the journey. 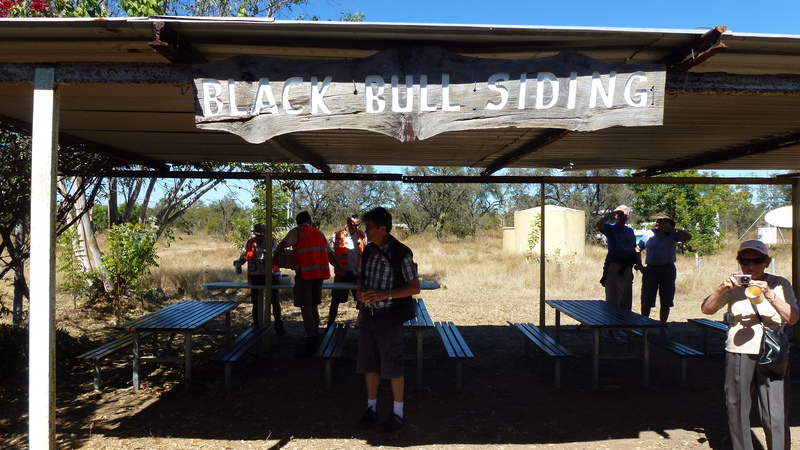 There is a half way stop at Black Bull Siding where the train stops and morning tea is served. Enamel billy mugs of tea and a muffin were enjoyed by all on board. After a thirty minute stop it is ‘all aboard’ for the rest of the journey. We were 15 minutes late arriving in Croydon, nonetheless, lunch was ready for us at the local pub. The choice of cold meats and salad may have something to do with the unpredictable arrival of the train. 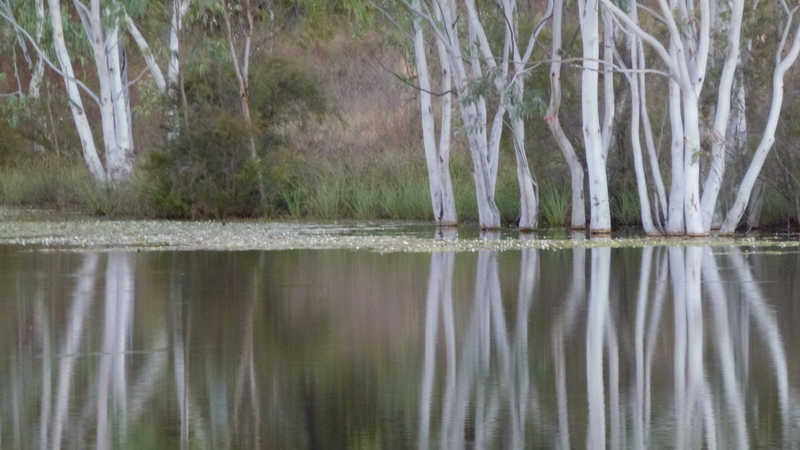 After lunch it was onto a bus which took us the 238km to Cobbold Gorge via Georgetown and Forsayth. It was a late arrival at 6.30pm, dinner being served almost immediately and bed. It was a long day. It is interesting to note that the ‘Gulflander’ has not turned a profit since 1907. This shaky situation is why I wanted to do this trip, and although the train and its infrastructure are heritage listed, I can’t see it continuing for ever. It is only going to take an extra big storm or fire to destroy some of the quite significant wooden bridges, and the powers to be will most likely decide to pull the plug. 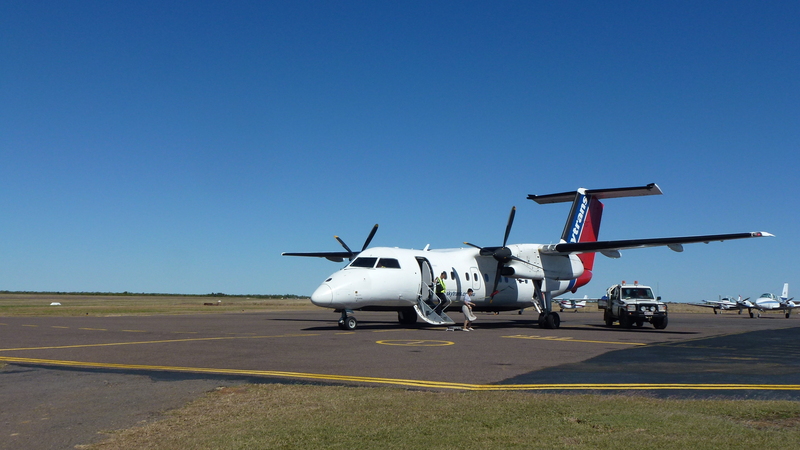 A Dash 8, 100 series plane, built in 1987, took us from Mt Isa to Normanton. Although only 380km, a relatively short distance for these parts of outback Queensland, it took us four hours to reach our destination. We landed at three other places before arriving in Normanton as we were on the twice weekly ‘milk run’. 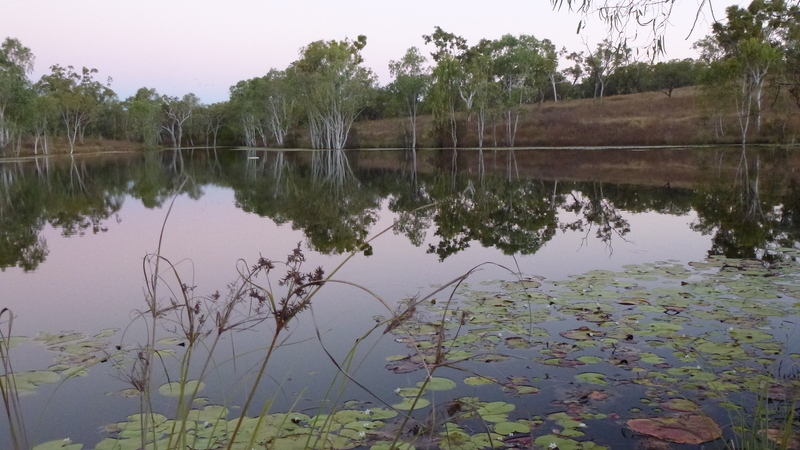 Firstly we landed at Doomadgee, an aboriginal settlement, then Burketown before flying across the north coast and over the Gulf of Carpentaria for a short distance to Mornington Island and its main centre of Gununa. Apart from exchanging a few passengers and some AustPost mailbags, not a lot happened at these stops. As the flight was booked many months ago, our tour company requested window seats for us all. Skytrans obliged so we all had wonderful views of the everchanging patterns and colours below. We were running 50 minutes behind time so were only allowed off the aircraft in Burketown. 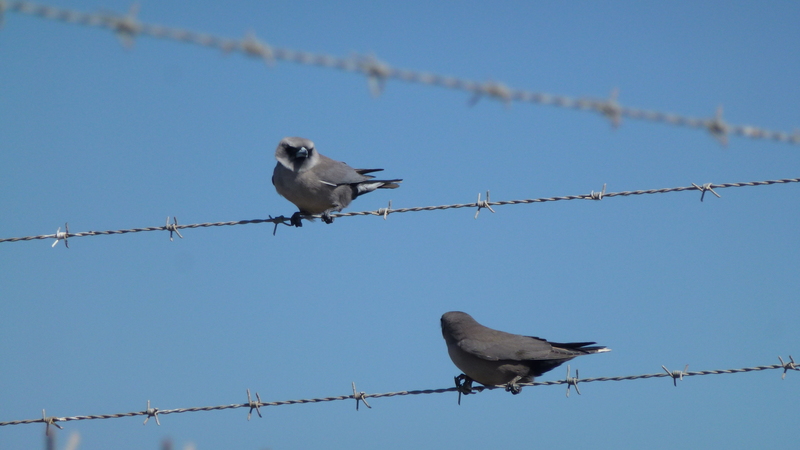 Wandering around the outside of the terminal (a small tin shed) we did see some black-faced wood swallows, zebra finches, a couple of brolga who obligingly took off to join some black kites already soaring on the wind currents. 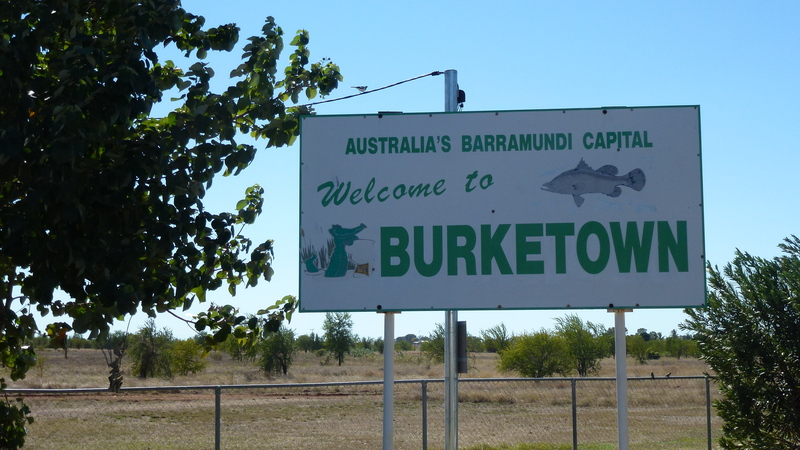 Burketown is an acknowledged centre for burramundi fishing. 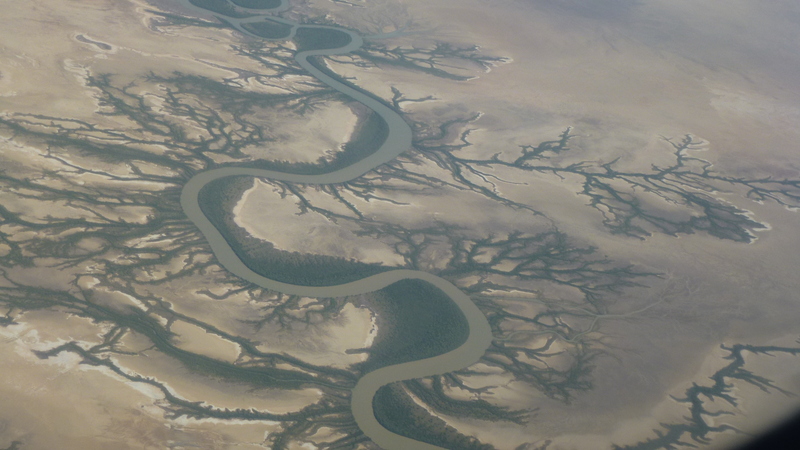 Flying in this area of Australia presents some wonderful patterns on the ground. The flight bookings had been made many months ago with window seats being requested for us all. This request was met so everybody had a good view. 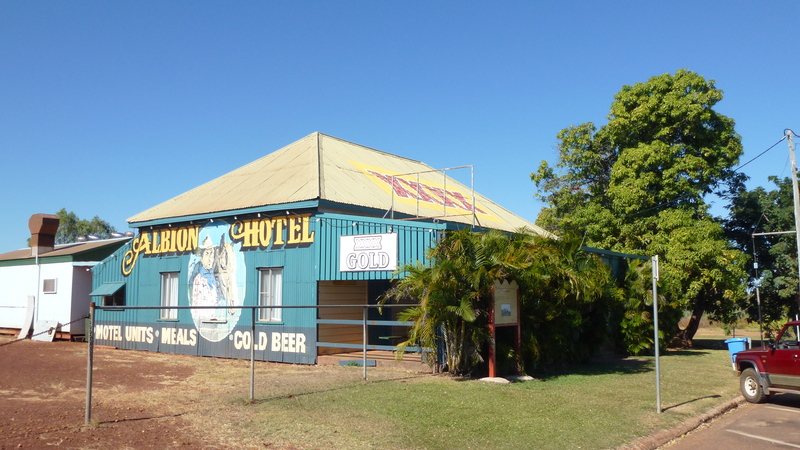 We eventually arrived in Normanton where we had a late lunch at the Albion Hotel. Our tour leader generally had the lunch menu so we made our choice from this before he phoned ahead. 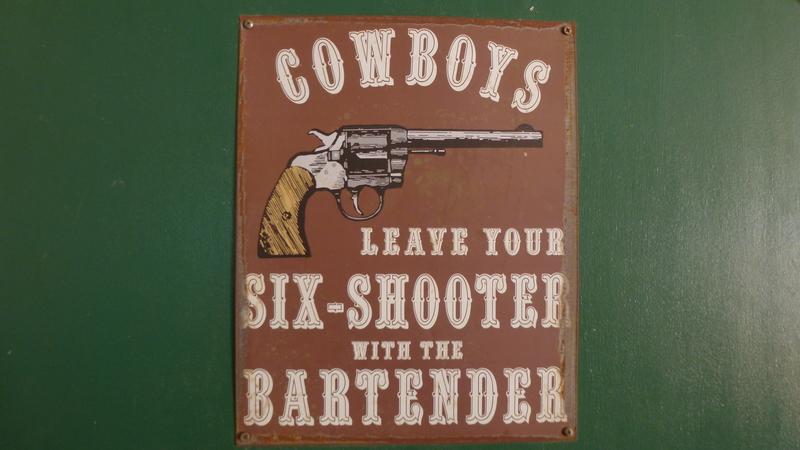 This gave the limited staff at these places a chance of serving us in a reasonable time. The menu generally had things like pies, sandwiches and wraps to choose from. This pub was built in the late 1880’s in Croydon and relocated to its present location in Normanton during the early 1900’s. After lunch we boarded our specially chartered Rail Motor (RM 60) for the four mile run to the first turning triangle out of Normanton. 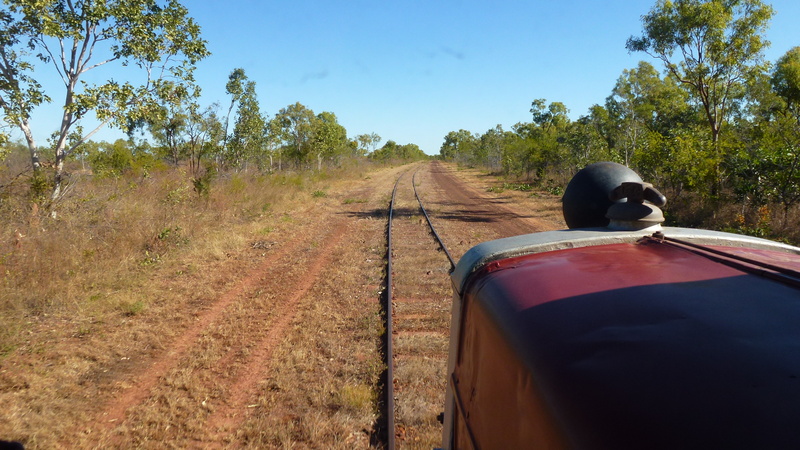 This length of track is all part of the Normanton yards, if we had wanted to go any further east, we would have had to get permission from ‘Control’ in Townsville. The driver could loose his job without this approval. RM 60 is a unique vehicle. 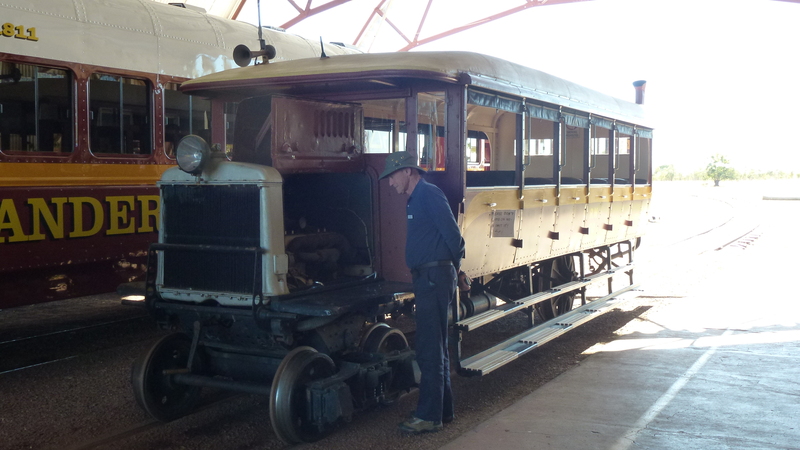 It is powered by a 45hp AEC motor and was built in the Ipswich Railway Workshops in 1931. It’s a rough ride over rough lightly constructed track, but a thoroughly enjoyable experience. As big as the mine is, the whole infrastructure is to be demolished over the next 3-4 years as the ore bodies beneath this part of the mine are worth many more millions of dollars than the buildings. The removal of these buildings will allow for the creation of a super pit which will be over 5km long and provide ore for the next 70+ years. At present the mine is working at a depth of 2800m. The lift that gets the miners to the workings has two decks, each of which carries 92 people. The lift descends at a speed of 63km/h to level 22 which is at a depth of about 1000m. From there the workers are taken to their worksites in Toyota vehicles. These vehicles only last two to three years because of the very difficult conditions under which they operate. Once no longer serviceable they are crushed, presumably by some vehicle larger than themselves, and pushed into a worked out stope which is then back-filled. Why does the mine keep using Toyotas, when they only last a few years? They outperform and outlast any other comparable vehicle. Apparently there is billions of dollars worth of equipment that has been dealt with in this manner, buried underground. The mine produces its own pollution which is expelled from four large chimney stacks but as the prevailing wind is westerly, this pollution is blown away from the town and out into the dessert. It is said that the copper content of this smoke is the reason why the Western Red Kangaroos out in the Simpson Desert are a coppery colour!? 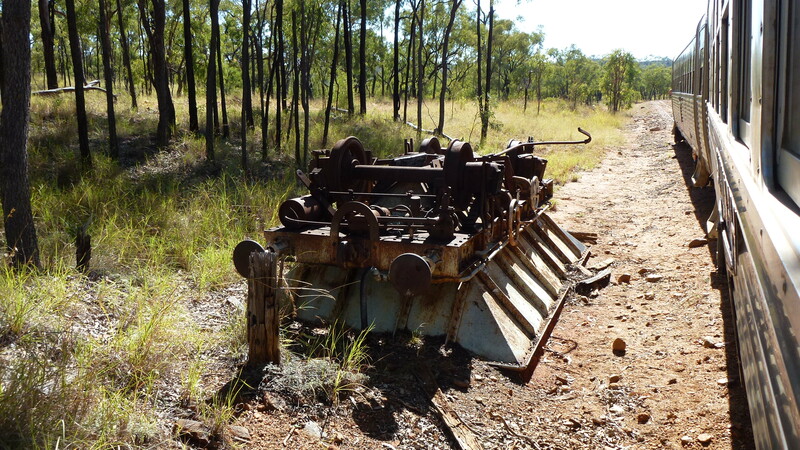 There is a small mine which was abandoned many years ago a little further into town. Xtrata has set this old working up as their training centre for new workers and as a visitor experience. Called the ‘Hard Times Mine’, it was not given that name for the obvious reason but because it was the name of the dog that belonged to the prospector who discovered the mine! Visitors are taken underground where all facets of a day in the life of a miner are experienced. 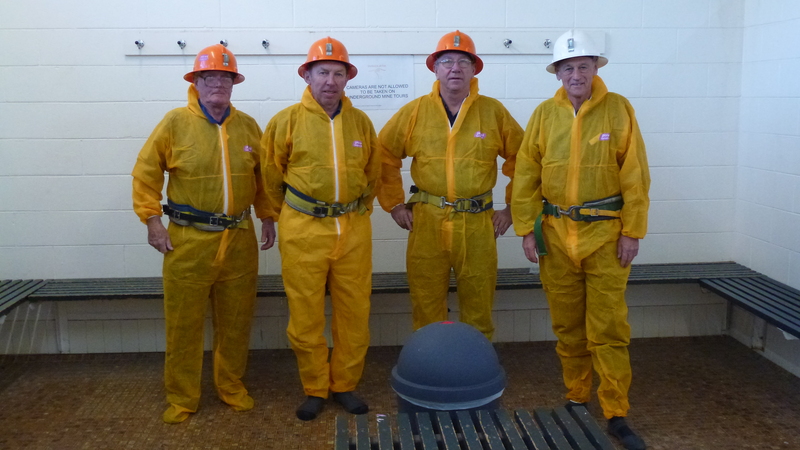 We had to don safety gear which included a bright orange set of coveralls, a helmet with light and gum boots. We really looked as though we meant business. We were ushered into a cage which lowered us into the mine, down a distance of only about 20 metres, and certainly not at the speed of the real thing. It was a rather sedate descent, with of course, the obligatory ‘power failure’ and therefore unscheduled stop. This all fell a bit flat as most of us had been underground before and were up with the tricks the lift operators get up to. Underground there were all the usual things from reo bolted to the walls and ceiling to prevent cave-ins, to vehicles and various drilling apparatus. The miners don’t like the reo bolted into the rock as they preferred the old wooden props which they say ‘talked’ to them. This gave the experienced miner a warning of trouble ahead. The metal doesn’t talk until it fails; then it is all a bit too late! It was a great tour with the two and three quarter hour experience coming to an end all too quickly. It is, however, as close to being a miner I want to get. We were not permitted to take any cameras below ground. One comment that has to be made is about the size of the meals served around town. They are huge and rightfully so for a workforce which expends so much energy all day, every day. But, for us poor pensioners, the thought of having to wade through the colossal plate full of food is all a bit daunting. Mind you, most of us manage, but I think it is mainly because we were brought up to eat what was put in front of you and not waste food. Please, more buffets, where portion control is our business. Two of our group have lived in The Isa in the past. B.. was an R and D manager and lived in the town for 8 years, the other, S…, was the wife of a mine worker. They decided that they wanted to reminiscence and have a look at their old homes so we jumped in a taxi and ventured into the suburbs. 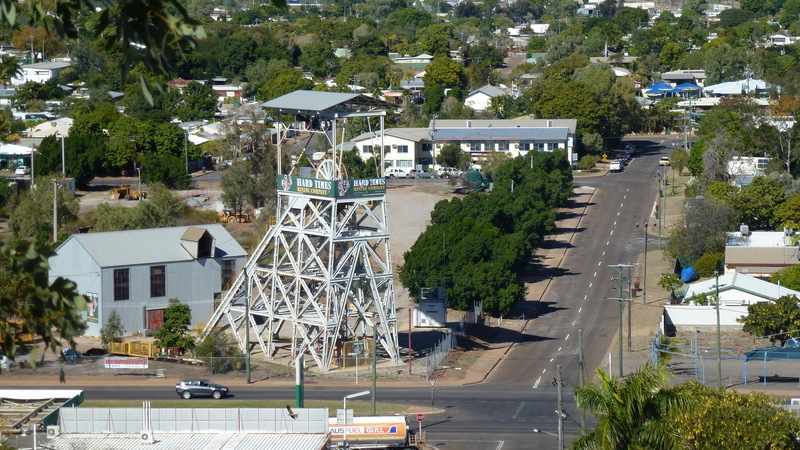 This took us off the beaten tourist track and gave a pretty good idea of the real Mt Isa. This turned out to be a worthwhile exercise for us all, as they found their respective houses in equal or better condition than they remembered them. ‘Townsville’ is the third name this settlement has had. 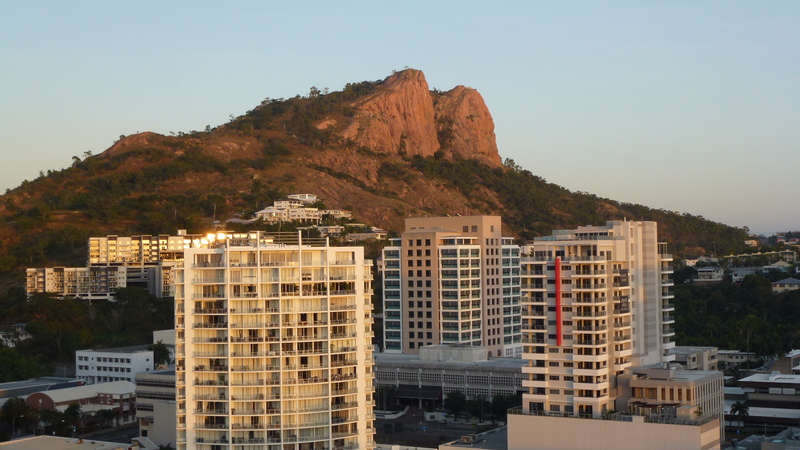 It was originally called Cleveland Bay, then Castle Town, after Castle Hill which dominates the central part of town, and now Townsville. The first settlement, in the late 1850’s, came about as a port was needed to ship in the needs required by the first settlers and of course ship out their produce. It is now a city of over 130,000 residents, not the least of which are 17,000 military, mostly army, personnel. 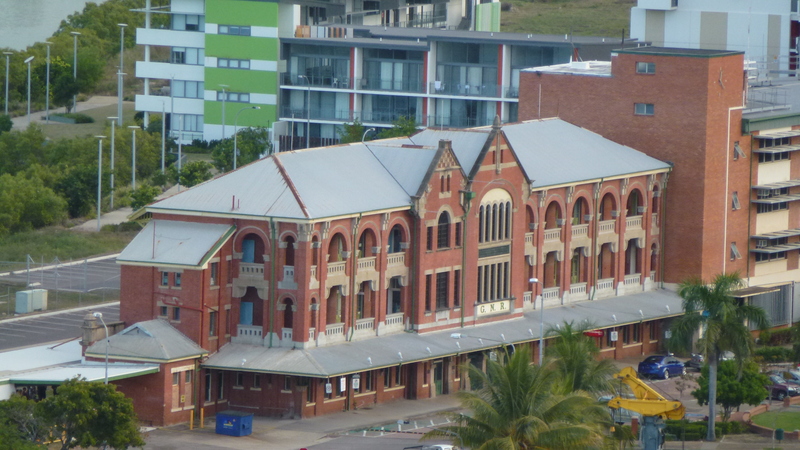 A quick tour of town took us past some majestic old buildings including the old railway station; the foreshore and its Strand and a climb up Castle Hill for an overall view of the city and surrounds. 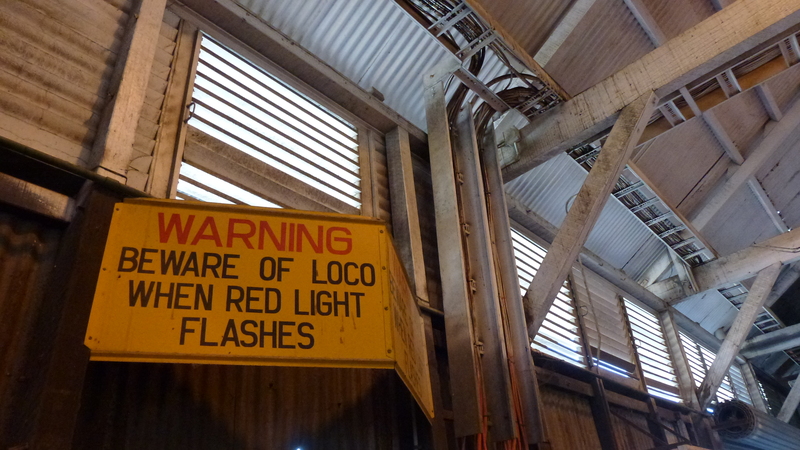 We ended our quick tour of Townsville at a very derelict set of sheds which housed the North Queensland Branch of the Australian Railway Historical Society. Their collection of bits and pieces was most uninspiring but they put on a good morning tea, which in most cases, doubled up as lunch. Medium sized home-made pies, cakes, scones with jam and cream, various cakes and a good cup of tea. It was then off to the station which was just around the corner to await the arrival of the ‘Inlander’ from the marshalling yards. The ‘Inlander’ was to be our home for the night. 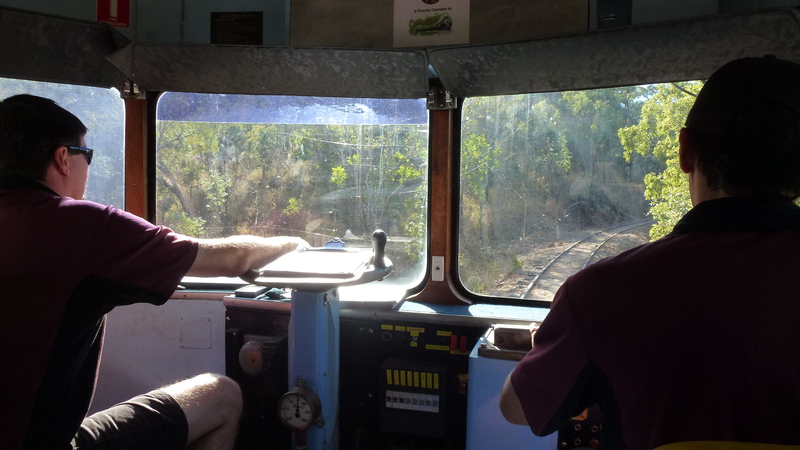 There was a technical hitch with the locomotive which resulted in us not leaving until some 50 minutes late. The ‘Inlander’ consists of 6 carriages and a single diesel loco. 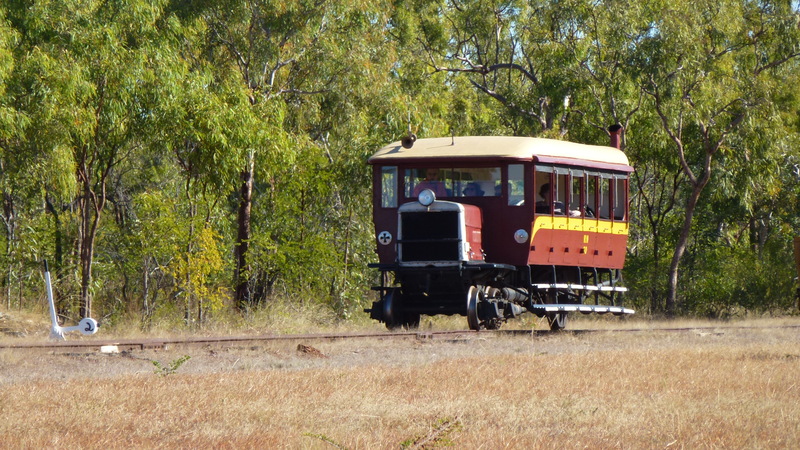 The Queensland Railways runs on track which is 3 foot 6 inch gauge. 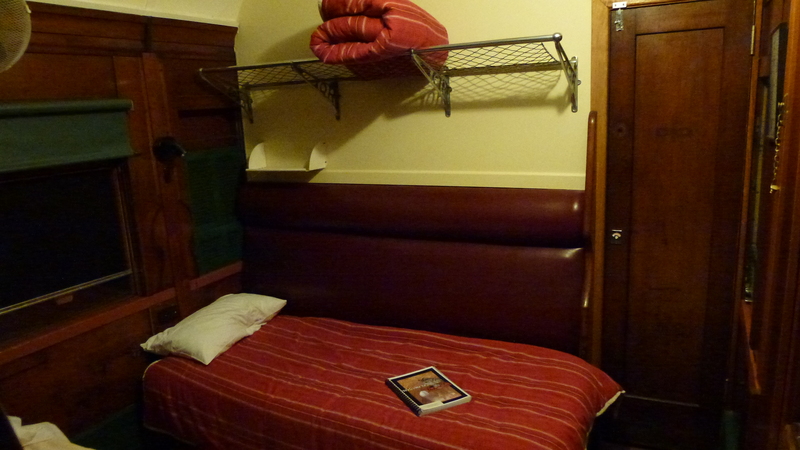 I have a single berth cabin which is quite cosy but manageable. All the couples have three berth cabins but there is nobody allocated to the upper berth! I’m very lucky having drawn the straw that put me in the last cabin in the carriage – the one closest to the opening doors, shower and right on top of the squeaking bogie and carriage buffers. What more could I possibly want. QR, like British Rail, is not known for good food. Whilst waiting on the station to board our train, we saw dinner go past. It consisted of moulded food shapes that contained our dinner in separate depressions. Talk about depression! We found out after leaving that these ‘nasty’ shapes contained chicken and veg or corned beef and veg or bangers and mash. Which one would you choose? If we’d known what they contained we may not have boarded. The other horrible thought is, was it the microwave to heat our dinners that was the technical problem which caused our delay?! Hope they fixed it properly. 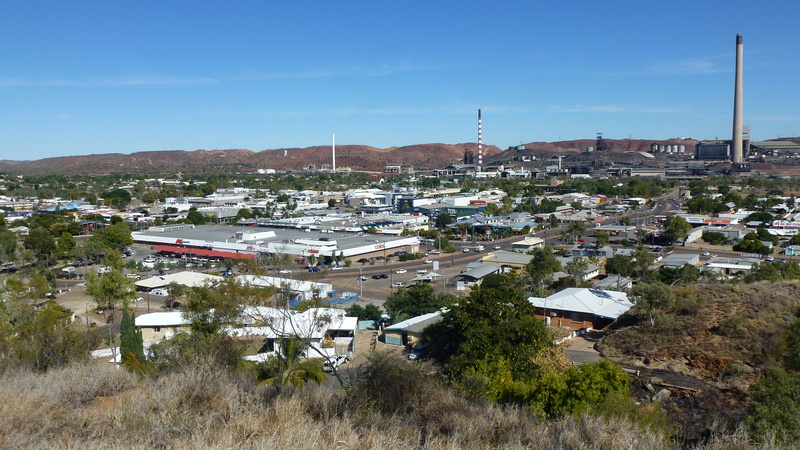 The road journey from Townsville to Mt Isa is a distance of 906km. The railway line parallels the road for all but the last 120 or so kilometres into The Isa. Instead of continuing pretty much due west from Cloncurry, the line dips SW for 180km to a mining area called Duchess before heading NW to its destination. This adds an extra 75 kilometres to the journey which takes around 20 hours all up. There is quite a bit of road traffic on the highway which parallels the tracks. The roadway must be all of 100 metres from the track for many kilometres at a time, and dead straight. Many cattle trains use this road. 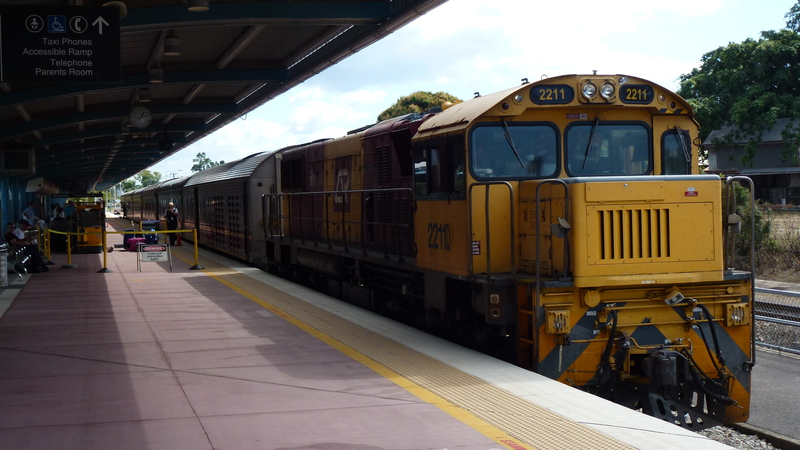 Most are a semi-trailer prime mover with two semi-trailer sized ‘dogs’ behind. Overtaking must be a formidable task for all but the most powerful of cars. 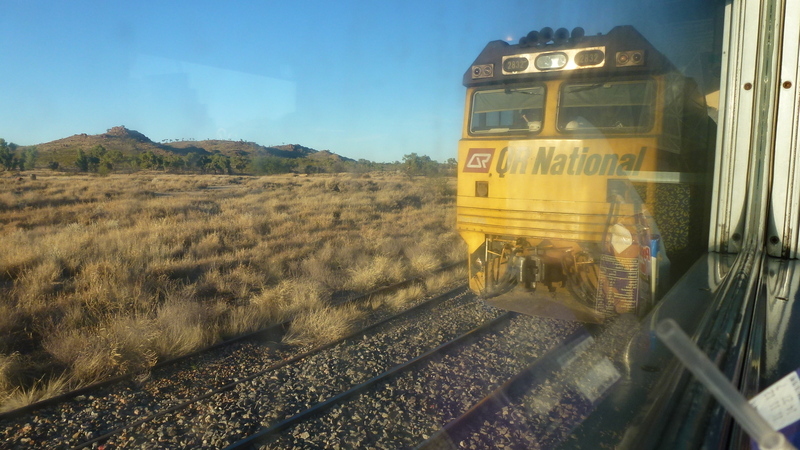 Since leaving Townsville we have slowed to 25km/h many times to traverse passing loops with the odd complete stop for reasons totally unknown to the train’s passengers but obviously for good railway reasons. (From people on the left hand side of the train I later heard that we passed trains carry ore to the coast.) That works out to be an average speed for the complete journey of a bit under 60km/h. Not bad for QR! The whole area traversed so far is through relatively flat savannah grasslands with eucalypts and wattles. There is the odd chain of little hills and rocky outcrops scattered across the broad landscape. It is very good grazing country for Brahman and Brahman/cross cattle. It is half 5, the sun is about to drop below the horizon so it must be time to break out the cashews and wash them down with some of that ‘medicinal’ whisky I’m carrying around. Anything to lighten the load, and to mask the thought of dinner. I’m foregoing the strawberry cheesecake or Black Forest cake for dessert.